Our trained technicians are proficient in installing, reconfiguring and repairing home, auditorium, office, hospitality and modular furniture. E-Movers also offers professional installation of home, auditorium, office and hospitality furniture. Offering state-of-the-art and highly specialized functions of receiving, uncrating, on-site delivery, assembling, configuration and installation – we are a one-stop shop for managing all kinds of furniture installation. E-Movers furniture installation technicians are experienced in the assembly procedures of a variety of high quality office cubicles and panel systems, ranging from an individual office to multiple office projects. Thanks to years of training and experience, our staff are well versed in the installation of a variety of office furniture systems like Bene, Herman Miller, Haworth, Kimball, Steelcase, Bif, Tuna, Konig, Fantoni, Senetor, Las, Unifor, Estel, Technion and more. Unloading the Container Once the furniture meant for installation, reaches its destination, the staff carefully unload it and make sure that it is safe and in good condition. We also check all items against the packing list and inform the client if there are any damages or discrepancies. Distribution of Furniture Once the furniture is unloaded, we distribute it as per the drawings provided. Installation of Furniture E-Movers has a vast experience of assembling almost all the brands of furniture from Malaysia, Italia, Spain, China, Korea and America. We also have virtually every tool required to assemble furniture professionally. Clearing of Debris Once unpacking and reassembling is complete, we make sure that all the debris is cleared from the site. If you occupy a modular office system and you wish to change the arrangement, E-Movers can analyse your needs and handle any changes or adjustments that you request. Our project coordinator will assist your staff in the various schedules needed to ensure that everything goes smoothly. We can draw a list of your current inventory including existing furniture and equipment and then determine what additional items are required to complete the reconfiguration. 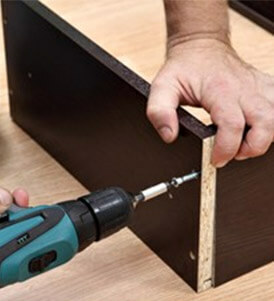 We can also disassemble the existing furniture and reconfigure it to your new plan with the least amount of down time for your entire company. E-Movers’ sister firm ‘The Leather Doctor’ provides services for cleaning, restoring and caring for fine leather products and fabric upholstery. The Leather Doctor is an Australian franchise owned and operated by E-Movers in the Middle East. A team of 40-strong technicians offers rapid on-location and workshop services throughout the UAE, applying practical and cost-effective leather repair solutions that many customers have been seeking for years.